No HDTV should be without great audio. However, the speakers in today's ultra-thin flat panel TVs are small, shallow and often face down or are behind the TV, none of which is good for sound quality. So we're left with muddled dialogue and special effects that fall flat. Hooking up a full compliment of five speakers for a surround-sound system, though, means more boxes and more wires. So, increasingly, people have been turning to the soundbar, a single, compact enclosure that houses two or more speakers and can be placed discretely under your TV. Many models also include a separate subwoofer, for those looking for a little extra oomph. Which ones are the best? 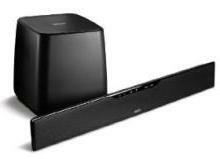 We selected five soundbars, with prices starting at $225, that would be an excellent addition to any TV. One of CNET’s favorites, and with a 4.2/5 average customer review on Amazon, it’s a crowd favorite too. Featuring a built-in 60-watt subwoofer, the YAS-101 also has two 30-watt amplfiers driving two 2.5-inch full-range drivers. Two optical and one coax are the digital audio inputs, but there is not HDMI input. You can add a subwoofer if you want more bass. Stepping up to the Haier SBEV40 gets you a wireless subwoofer and a lot more power. Each of the two drivers in the bar get their own 70-watt amp, while the sub has its own 140-watt amp. It’s also slimmer than the YAS-101, so it can fit in more places. Two HDMI inputs make it more versatile than the YAS-101. This one was rated highest by CNET. Sporting a thin design like the Haier, the Polk SurroundBar IHT 6000 also has similar power, with 160-watts for the bar, and 120 in the subwoofer. The sub has a 7-inch driver, sizeable for this class, and Polk claims its -3 dB limit is 50 Hz. Polk’s “Digital Logic” claims to optimize the SurroundBar to the room it’s in. Unlike the Haier, there’s onboard Dolby Digital processing. From 119 customer reviews, the Polk gets an average of 4 out of 5. The SB16 is another CNET top pick, with praise for its excellent sound quality and overall design. This is despite being slightly down on power from the other soundbars so far, with 25-watts for each channel and a 100-watt subwoofer. The key is in the multi-driver design. Where the others here largely rely on one speaker driver per channel, the SB16 has a 0.75-inch dome tweeter and two 3-inch cones per channel. At the top end of our picks, the Atlantic Tech PowerBar 235 is bulkier than it competition, but for good reason. Using clever engineering, AT has been able to get serious bass out of a very small bar using only 80-watts and two 4-inch drivers. I’ve heard this bar several times, and it’s incredible the sound you can get out of something so small. It’s pricy, so if you’re looking to spend this kind of money we’d recommend checking out a receiver and separate speakers. 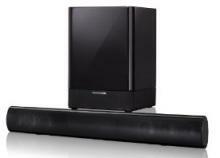 But if a soundbar is the way you want to go and you’re looking for big sound, the PowerBar 235 is your best bet. Geoffrey Morrison writes for HD Guru and many other leading tech publications. Check out Geoff’s first novel: Undersea.